GoDiagram has been designed and implemented to take advantage of the many new features that Microsoft .NET and ASP.NET provide. GoDiagram is implemented entirely in managed code. GoDiagram is just what you need to bring your application to life, quickly and easily. Northwoods is a member of the Visual Studio Partner (VSP) Program. As a VSP member we work closely with Microsoft to ensure that our .NET products integrate seamlessly into Visual Studio .NET. 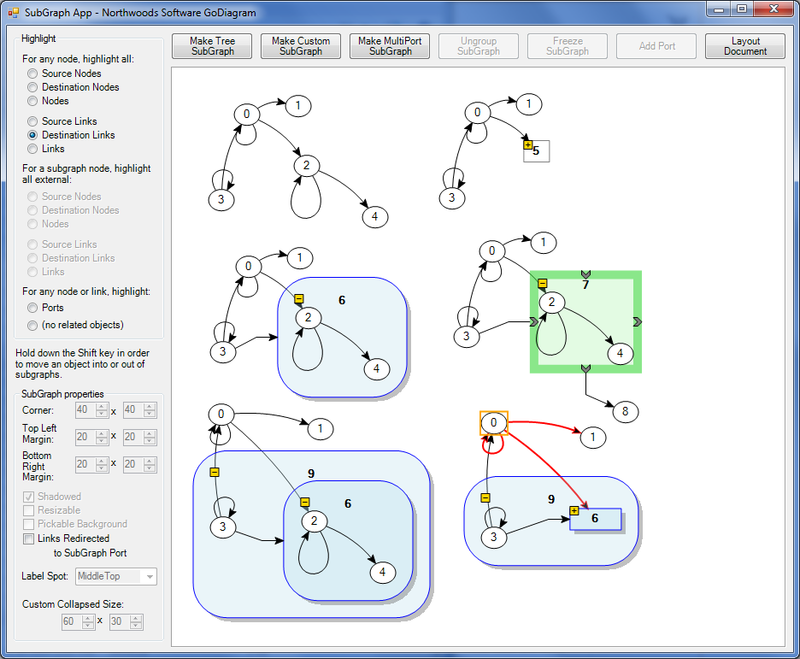 The evaluation kits include both the basic GoDiagram controls as well as the AutoLayout and Instruments options. User Guides and an API Reference Manual help file are included. Complete source code for the sample applications, in both C# and VB, accompany the sample applications themselves, and you can modify and rebuild them. Both Win and Web have a full set of advanced feaures: graph layout, instruments, XML save/restore, export as SVG and PDF. 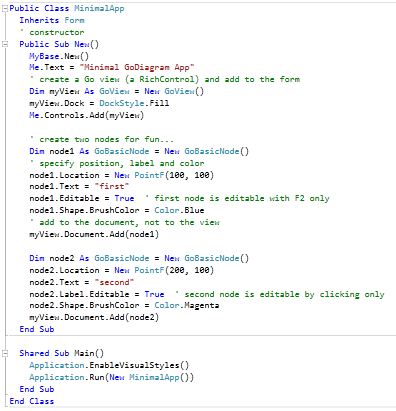 Here is the full VB.NET source code to MinimalApp. The screenshot shows how the MinimalApp appears after selecting the two initial nodes, drag-copying them, moving them, creating links between some of them, and then renaming a blue one to “blue” and a magenta one to “magenta”.